This year’s Thanksgiving celebration marks 50 years since the American military embarked on the biggest bombing campaign in history, decimating the small Southeast Asian country of Laos by dropping more than two million tonnes of bombs on it at the height of the Vietnam War. The Lao government’s failure to strictly enforce foreign investment laws is allowing a growing number of Chinese entrepreneurs to dodge investment rules and avoid paying taxes while operating shops and restaurants in the Southeast Asian country, an official from the Ministry of Planning and Investment told RFA’s Lao Service. Hangzhou Safefound Technology Co., Ltd., a China-based company, is keen to develop solar energy in Laos because the country has the perfect geographical location for almost year-round sunlight. Naval commandos from China, Laos, Myanmar and Thailand have completed on Wednesday a joint police patrol on the Mekong River, in order to strengthen security measures and fight terrorism and cross-border crimes in that river. The agencies responsible for tackling corruption in Laos and Myanmar yesterday met in Vientiane to share their experiences in the field during a visit by members of Myanmar’s Anti-Corruption Commission (ACC). The Lao government’s top economic research agency has suggested that investment focus in areas that would make use of and maximize the benefits of the Laos-China railway. The government has expected that the growth in the agricultural, industry and service sectors will below set targets, according to Deputy Prime Minister and Minister of Finance Somdy Douangdy. The Lao PDR’s main development cooperation and policy dialogue forum, the annual Round Table Meeting will be held in Vientiane on 4-5 December. 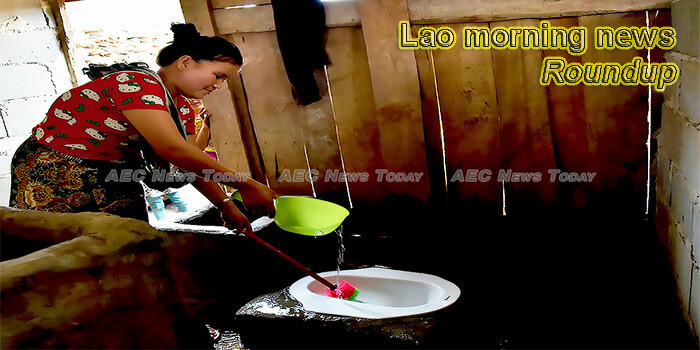 The victims of a dam collapsing in southern Laos are now expecting better lives with the support and help from the government and other sources. A senior film archivist, Mr Bounchao Phichit, has won a South East Asia-Pacific Audiovisual Archive Association (SEAPAVAA) Fellowship – the first time anyone from Laos has won the award. External Affairs Minister Sushma Swaraj will pay a two-day visit to Laos from November 22 where she will co-chair the 9th Meeting of India-Laos Joint Commission on Bilateral Cooperation with her counterpart Saleumxay Kommasith, a statement said. The Annamite mountains of Vietnam and Lao PDR (Laos) harbour exceptional species richness and endemism, but its wildlife is under threat from widespread and intensive poaching. Laotian Defense Minister Chansamone Chanyalath thanked the Russian military for helping the country clear out remaining unexploded US bombs left over from the Vietnam War. Bazaar-B Cash and Carry, the largest wholesale centre in Vientiane was opened on Nov 16 in the presence of Governor of Bank of the Lao PDR Sonexay Sitphaxay, business people, and Vientiane residents.